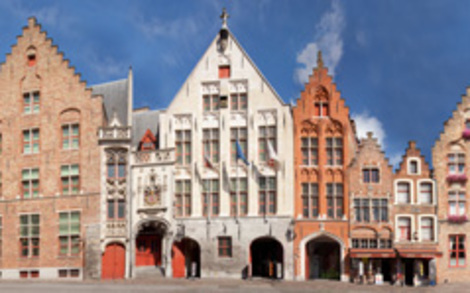 From the 13th to the 15th century, Bruges was an important trading centre at the crossroads between the Hansa cities of Scandinavia, England and Germany (known collectively in those days as the ‘Easterners’) and the most important commercial regions in France, Spain and Italy. The Spanish traders established themselves at Spaanse Loskaai (Spanish Unloading Quay), while the Easterners set up shops on the Oosterlingenplein (Easterners’ Square). Places where you can still feel the atmosphere of days long gone by. Standing in the middle of the square the renowned Bruges painter Jan van Eyck (1370 – 1441) proudly overlooks the domain that wears his name.Still, he has to share the limelight with the square’s alluring style for once this was the old harbor of Bruges where ships loaded and unloaded. In the Middle Ages a toll was levied at St. 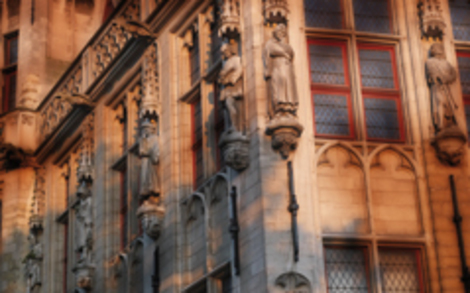 Right on the corner of Jan Van Eyckplein there is a striking building with a dramatic tower. This corner house was once the headquarters of the Florentine merchants and it dates back to the 13th century.